Leading watch brand in Japan gave the original presentation of the new watches in racing series Red Bull Racing Edifice. Eve of the Italian Grand Prix Autodromo Monza witnessed unusual events. Casio has decided to conduct original presentation novelties in the form of quiz. Participants were presented a new timepiece EQS-A500RB limited edition Edifice, produced it in collaboration with the “Formula 1” Red Bull Racing. Two-time winner of the “Formula 1”, the pilot team Red Bull Racing Sebastian Vettel, team manager Christian Horner and former pilots of the “Formula 1” Martin Brundle and Johnny Herbert took part in the quiz “Speed and Intelligence” (“Speed and Intelligence” ) on their favorite sport. During the quiz, which was the leading comedian Tom Gudliff, participants had to perform a variety of tasks – from sound tests to answer questions printed on cards. 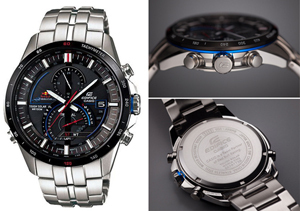 All tasks are performed on time, and were used as a stopwatch watch Casio Edifice EQS-A500RB, enlarged to giant size. Among a number of distinctive features of the new model EQS-A500RB, which will go on sale this year, you can select the technology Smart Access, recharged by solar energy, water resistant to 100 meters and a stopwatch accurate to 1/20s.